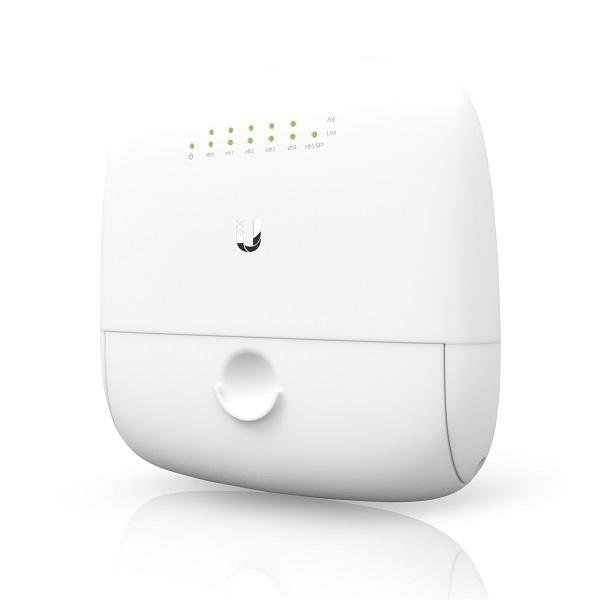 Ubiquiti Networks introduces the EdgePoint™, part of the EdgeMAX® platform. The first application-specific designed WISP control point, the EdgePoint combines EdgeMAX routing features with fiber backhaul and versatile powering capabilities. A single, compact controller efficiently eliminates clutter, expensive cabinets, extraneous installations, and excessive maintenance. The ruggedized case withstands outdoor conditions, including wind, rain, and snow. The included cable sleeve protects the cables and cable opening. If you prefer, you can swap it out for your own conduit. For the EP-R6 and EP-R8, powerful routing features – such as load balancing and failover– provide redundancy and increased performance for outdoor wireless links. For the EP-S16, layer-2 link aggregation provides similar redundancy and increased performance benefits. Powered by 54VDC or by PoE, the EP-R8 and EP-S16 can support 54 or 24V passive PoE to power all Ubiquiti® products, including airFiber® and airMAX®. Powered by 24VDC or by PoE, the EP-R6 can support 24V passive PoE to power most Ubiquiti products. Example of EdgePoint as WISP Control Point The EdgePoint replaces a cabinet containing a patch panel, power rack, multiple PoE adapters, syslog server, AP (for EdgePoint management), switch, router, and modem. The EdgePoint features a graphical user interface designed for convenient setup and control. Accessed via a network port and web browser, the user-friendly interface provides intuitive management with a virtual view of the ports, displaying physical connectivity, speed, and status. Depending on whether you are configuring a router (EP-R6 or EP-R8) or switch (EP-S16), the configuration interface will differ. Three EdgePoint models offer a variety of hardware features for your application. The EP-R6 features five RJ45 Ethernet ports and one SFP Ethernet port.